Congrats to Camille and all the other finalists! And endless thanks to all the judges for your tireless in sorting through all these entries. Must've been exhausting. Camille, that was a great story and deserved of the win--congrats! And congrats to the finalists as well. A great contest to be a part of all around. Hooray for the winner and the finalists! Wonderful job of writing and judging. Congratulations everyone! Great contest. There were lots of wonderful entries. Very tough competition. Thanks to everyone who entered and thanks to all those who have taken the time to read all the entries and leave comments! Congratts Camille! Great story. Congrats to the finalists. Thank you all who ran and judged the contest. I had a blast. Can't wait until next year. Congratulations to all the winners. Thanks, also, to all the contributors, commenters and organizers. I think I'm done hyperventilating, now. What a surprise and an honor to be chosen among such amazing writers. Thank you so much for reading and judging and coffee drinking and arm wrestling. And Wendy, I really hope that you didn't have to follow through with that punishment. I am so happy to see that some of my favourites placed! Congratulations to Camille and all the finalists. In my eyes, I believe everyone who entered is a winner. It took courage and confidence in your ability to enter this contest. Everyone should be proud of themselves. Yay Camille! And Ian, Josh, Thom, Jasmine, D.A., Jodi, Emma, Debbie, Dino (last year's winner), Douglas, Meg, Michael, and Jamie. Hope to see you all again next year. If you want to know who the true winner* is, it's me: I got to meet a bunch of cool new people. *Drinks, nevertheless, are on Camille. I enjoyed that. Great winner. Great contest. I hope she's not wearing "dry clean only!" Oh my gosh, if Camille's excitement is any greater than mine she needs a Xanax about now. I keep checking the list to make sure my name is really there...what an honor. So many great stories, and I am more than thrilled to be named as a finalist. It just makes me want to continue writing - and continue to enter contests like this to get my writing to a wider audience. I want to thank the editors for all their hard work in this. And congrats to Camille, a wonder read. Congratulations to Camille and all the other finalists. 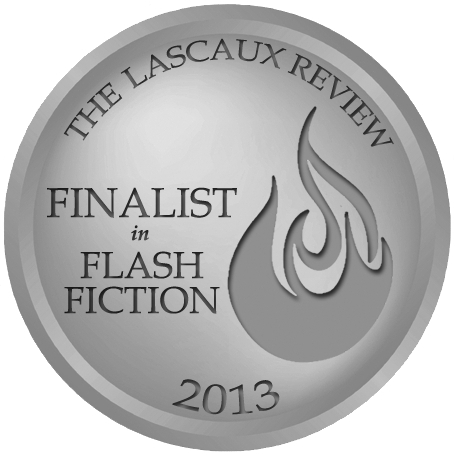 Many thanks to the Lascaux team for having this contest and supporting the writers. I like that you post all the entries and allow us to comment and get feedback on the stories. I enjoyed reading all the entries. And I look forward to next year. I was really glad to see my favorite story in the contest, 7-11, receive recognition as a finalist. The winner and other finalists were also exemplary, so congratulations to everyone. I enjoyed entering, and would love to participate again next year. Congrats to all the entrants, finalists, judges, and of course, to Camille. It was a wonderful contest. Thanks to everyone at Lascaux for putting on a great show! Congrats Camille, and everyone else who got oh-so-close. Thanks Team Lascaux, for keeping the fire burning post CoN. I wasn't as active as I would've liked, for the duration of this contest, as I was shifting houses. Hope to make up for it the next time around. Congratulations to Camille and all the finalists - well done! Thanks, Lascaux team for all the hard work that goes into running such a contest. Congratulations to Camille and all the finalists. I am very proud of everyone, including myself, who took the time to enter. We all placed what we hoped was an enjoyable story together and let the entire internet community read it. Congratulations to everyone for being so brave. Everyone did a fantastic job! I had a lot of fun reading all of the entries... and I really hope to get to see more great work from a lot of you. Congratulations to the winner and finalists. You guys absolutely rock! Congratulations to all the winners. A fun contest. Pls do it again next year. Congratulations to Camile and all the finalists! Well deserved! And thanks to the Lascaux editors and judges for such a fine contest! Congratulations to the winner, and also to all the finalists! Congratulations also to the judges - that was a lot of reading! Congratulations to the winner and finalists - and thanks for a fun competition.